The famous original American dog breed of Boston terrier is a worldwide favorite for all dog-lovers. They are very friendly and welcoming to all humans – be it their beloved owner or an affectionate stranger. However, they can also get pretty moody at times. Nevertheless, they can be trained easily to be a “good boy” which also inspires them to protect their precious master. Like most pets, they are big foodies and love to have treats every now and then. Even if you decide to limit their daily intakes, their big puppy eyes may force you to change your mind pretty fast! When it comes to nutritious portions, owners are encouraged to feed them items rich in animal protein. Besides, different types of dog food are also necessary to keep them going for the playtimes, training and walks in the park. Among these food categories, dry ones will make their teeth stronger, canned ones will help them gain weight and semi-moist ones can be given to them on special occasions or to those who are picky eaters. To make sure you are buying the right food, in the right amount and for the right aged dog, here are some renowned and reliable options for you as declared by our dog enthusiasts. 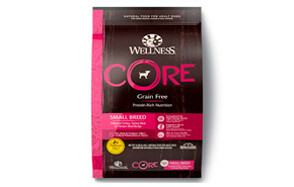 Wellness Core brings this grain-free food prepared especially for adult small dogs. It is available in a wide variety of flavors like turkey, chicken, lamb, ocean whitefish, herring, salmon, duck etc. Each variety is high in meat protein, thus balancing nutrition and delightful taste for your pet. The food comes with probiotics, vitamins, phosphorus, and calcium. Dogs from different aged will love this food item due to its savory goodness. It is free from wheat, corn, soy, artificial colors, and preservatives. Find it in five sizes of 4 pounds, 12 pounds, 22 pounds, 24 pounds and 26 pounds. 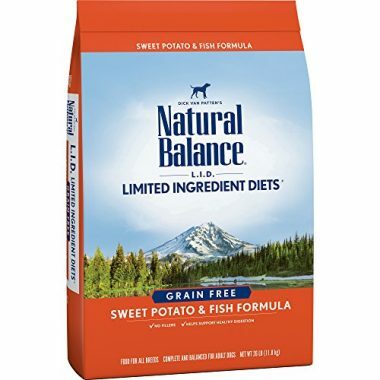 Natural Balance brings this dry dog food which is specifically made for the ones who are fully grown and are fighting some digestive trouble. Its rich formulation is prepared so that taking it regularly makes the skin of your Boston terrier shiny and silky smooth. It will take care of any skin disease they are facing at the same time. 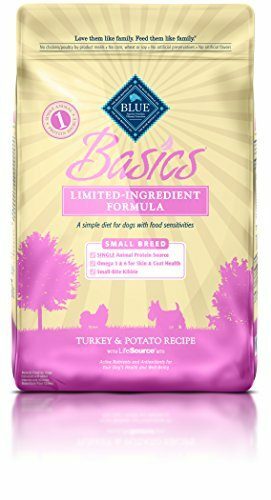 Packed with premium protein and carbohydrate sources, this grain-free food keeps the dog’s stomach healthy. The main ingredient of the food is salmon fish which helps the dog to make their muscles strong. Sweet potato is another vital ingredient for which the food becomes highly digestive for your dog. Being free from all artificial flavors, colors and preservatives, it can be a safe solution for any adult dog suffering from various problems. This can be the perfect companion for your dog if it has high sensitivity in terms of having food. In addition to being highly nutritious, this food also comes in various flavor combinations! Their range of flavors includes several kinds of meat or fish like turkey, duck, lamb, salmon etc. All of them are paired with potato which itself is a source of ample energy. The food is prepared with delicious and savory ingredients like pumpkin which also helps make the digestion process easier. Different fruits, vegetables and micronutrients are included for a healthier stomach which does not react adversely to unfamiliar elements. 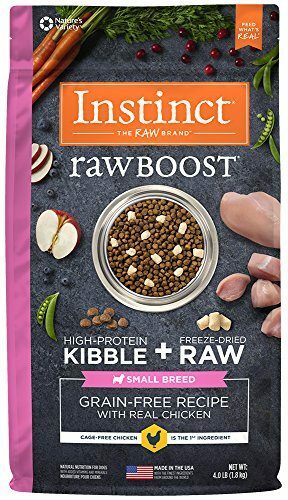 Its most special ingredient is BLUE’s unique mixture called LifeSource Bits which combines the vitamins, minerals and antioxidants in precise amounts to prepare the best blend of nutrition for dogs. Potatoes, oatmeal and brown rice can increase the dog’s physical immunity by making it stronger. No poultry or dairy products are used as an ingredient here. Instead, a harmless single-source animal protein is used from the flavor combinations mentioned above. Four sizes of this food are available in the market in 4 pounds, 11 pounds, 22 pounds and 24 pounds. 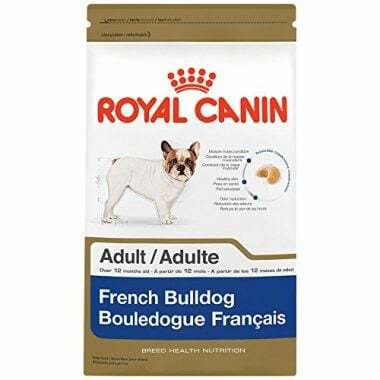 Royal Canin has prepared this food item especially for the French bulldogs to help them with chewing. These dogs tend to have the ‘brachycephalic” jaw which means they need specifically designed foods which inspire them to chew well. The breed of French bulldogs is recognized for having huge mass of muscles in their body. So to keep up the muscle mass high enough, the manufacturer has kept the protein percentage to an appropriate amount of 24%. It is also enriched with L-carnitine which is another powerful element for its growth. It keeps the dog’s skin healthy too by introducing an exclusive complex of nutrients. As a result of taking this food regularly, their skin gets a healthy amount of EPA and DHA making the skin stronger. Besides, brown rice, wheat, chicken fat, pork meal is used to enhance the protein level of the dog. This one made by Fromm Gold was made keeping all small breed dogs of the world in mind. The food is a cautious mix of duck, chicken and lamb meat to enhance the metabolism system of your dog. 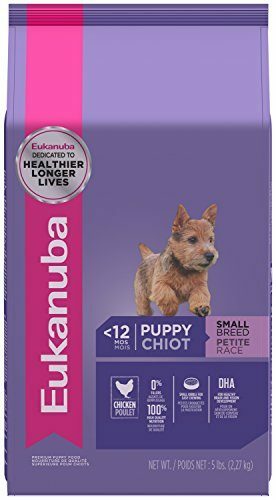 It also contains probiotics which have the potential to improve the dog’s digestion. Most dog food manufacturers tend to use wheat for adding more volume and cutting down costs. Not only is that an unnecessary dietary item, it causes allergy in many dogs and the pets hate its taste too. 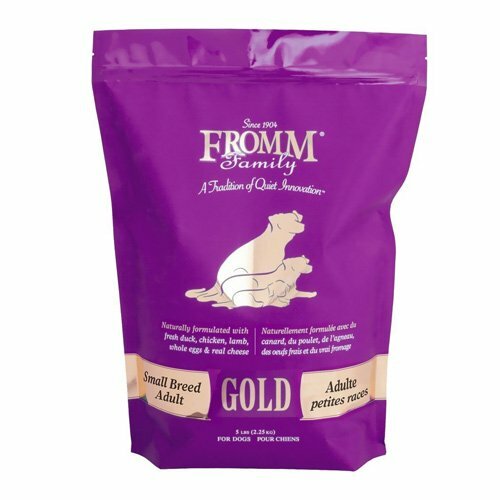 Fromm Gold Adult Dog food skipped the wheat so that your dog keeps coming back no matter what time you call it for meals. They will never walk away and enjoy the delicious goodness as long as the tray is not empty. Alfafa is another ingredient used in this mix to make their bones stronger while the vital element named chicory root lowers the risk of worms attacking in their stomach. Taurine keeps their heart healthy and eyes sharp to keep the guard dogs fit. Their organization inspects the food and its elements on a daily basis to only serve the fresh products to their invaluable customers. You can choose this one if your dog is facing problems with metabolism functions. It can be either in chicken flavor or in a combination of rice and lamb. Both small and large breeds can take its advantage. Six distinct sizes are available ranging from 5 pounds to 40 pounds. It is clinically proven that the ingredients are especially digestible for a dog’s body. DHA extracted from natural fish oil is part of those ingredients which will make your dog smarter and thus more easily trainable. 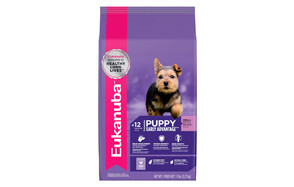 Eukanuba Puppy foods contain a specialized fiber system combining natural beet pulp with prebiotic FOS. This combo promotes higher rates of nutrient absorption and healthy digestion. Omega-6 and omega-3 fatty acids are also used in optimal levels to make the dog’s skin smooth and shiny. 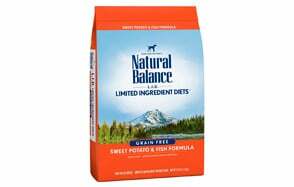 Nature’s Variety comes with this dog food to make their eating experience better and to give them a healthier diet. It can be found in many flavors including chicken, beef, duck, and lamb. Besides, some of them are aimed at particular breeds or age-groups. No matter which one you choose, all will have animal protein as the main ingredient which makes their muscles stronger. This food is free from all artificial colors and ingredients. It is full of phosphorus and calcium to make the teeth and the bone stout. Vegetable oil is included in this grain-free raw food to elevate its nutrition quotient. You can choose between 4 pounds, 10 pounds, 20 pounds or 21 pounds of this food depending on your dog’s age and physical condition. 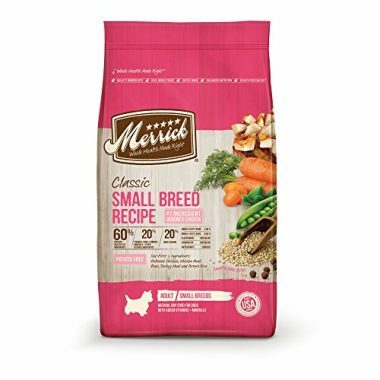 Merrick’s classic small breed recipe is enriched with meat protein that will help the dog to gain thick body mass. The ingredients are clinically proven to be safe, which include deboned chicken, turkey, barley, brown rice, and peas. The savory food contains no preservatives or artificial making it safe for your beloved dog. Apart from the meat protein, your dog will have the vitamins of carrots, apples, olive oil, omega-3 and omega-6 fatty acids through this food. The fatty acids particularly help in forming and keeping healthy skin. Significant amounts of Glucosamine and Chondroitin will make their hips and joints stronger. 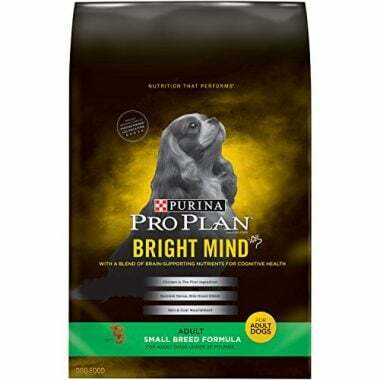 Purina pro’s food item contains a formulation which is prepared with utmost care. 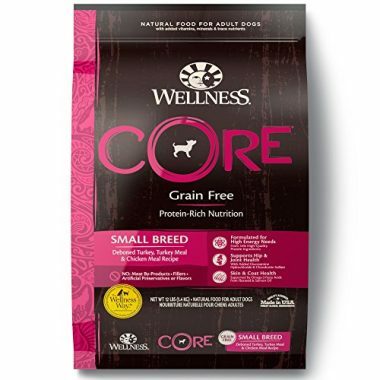 Premium protein and carbohydrate sources included in this grain-free formulation keep the stomach of your dog healthy. Here, 30% crude protein, 17% crude fat and 3% moisture are available in the food. You can treat your dog with its chicken favor or turkey variety for a versatile diet. Sweet potato is another vital ingredient that makes the food highly digestive. Vitamin B-12 supplement is used to improve the nutrition quotient in its body. Antioxidants make their immune system healthier. For a shinier skin, vitamin A, linoleic acid and omega-6 fatty acid act together through this food. The rich mixture of vitamin B, antioxidants, arginine, DHA and EPA promote cognitive health for your dog, making it smarter and more mindful. Find it in 5 pounds, 12 pounds, 16 pounds, 24 pounds and 30 pounds of size. The food is prepared to increase the weight for the dogs. It helps the old dogs to maintain a healthy weight while dealing with metabolism system. Small breed dogs aged 8 to 12 years need to take this food. Its high levels of protein and other nutritious elements keep the dogs free from dental plaque. 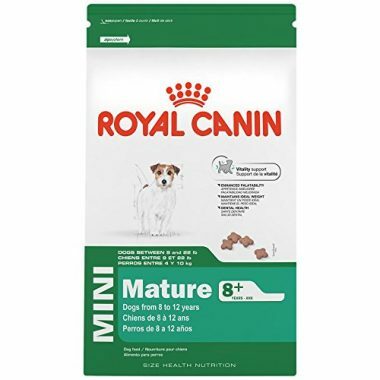 With two distinct sizes of 2.5 pound and 13 pounds, this dry food can encourage them to eat more frequently with its palatable blend of flavors. Entitled as the American gentleman, Boston Terriers don’t grow very tall or large but still capture heart with their adorable structure. Its average weight is 25 pounds and the height of this dog is around 17 inches. For this type of dog, protein, energy, carbohydrate, vitamins, and minerals should be present in the food. They require an animal-based source of protein since they are meat-eating animals. Dog food should be prepared for the sake of their bodily development. The ingredients must be completely natural and grain free. The nutritional value must be considered at the time of selecting such food. To increase the muscle mass for them, a fresh source of protein is vital. Contrary to some misconceptions, muscle mass doesn’t mean obesity. It only indicates the lean muscle resulting from vegetable oil and a healthy blend of fruits, vegetable, and the meaty protein. Although the Boston Terriers are miniature in size, they require a great deal of energy in the body since they love to run and play all the time. To keep up an energetic lifestyle like that, they require a continuous supply of balanced food and diet into their body. To regain their energy, they require different food items which trigger such energy. The food choice of the Boston terrier requires a mixture of protein, fat, carbohydrate, vitamins, and minerals to keep them healthy. The owner should keep his sharp eyes on their protein consumption since that is the main element of their growth. Chicken fat, fish oil, and plant-based food will also provide them with energy and consolidate their bones. Boston Terriers have a different food intake habit compared to other dog breeds. Although they love to eat food but are highly sensitive in taking their food. Not getting their particular choice of the dish can drive them to a dietary lethargy and they may stop taking food after a while leading to more physical damages. So every master of this breed should be very careful while buying their food items. Bones from the fish and chicken should not be included in the Boston terrier’s food since it will impede the metabolism system in their stomach. Cat food should also be avoided completely due to its incredibly high amount of proteins. Such high amount may cause obesity in the dog. Different types of caffeine should be strictly avoided as this type of food can cause high blood pressure for the dog and sometimes it can also become toxic to them. Boston Terriers don’t like dairy products at all. In most cases, these dogs don’t have the enzyme lactase in their body which causes diarrhoea. Onion should be avoided vigorously as this ingredient is very harmful to the dog. Raw eggs are not edible for them since they will affect their skin. Boston terriers keep their master busy all the time with their activities but they also suffer a number of common health problems in their lifetime. One of the most common diseases includes a breathing problem called brachycephalic syndrome. This can be triggered while traveling in the intense dusty wind. Patellar luxation is another type of dog disease found in their ligament. Since Boston Terriers love to play all day, they may face this type of disease as a result of being in constant movements. Once this trouble turns up they can’t even move an inch with their own effort. Hemivertebrae is another common disease of Boston terriers which can attack since the very beginning of their lifetime – the birth. It is caused by a defect or restriction in the vertebral body formation. Boston terriers sometimes suffer in their ears by a disease called the sensorineural deafness. The infection is highly serious for the dogs. The symptoms of this disease include repeated scratching on the ear side, continuous shaking of the head and bad smell rooting in ears. If this symptom is seen the owner must take the dog towards a reliable vet as soon as possible. Out of all the diseases, the eye disease is the most dangerous and extreme. Glaucoma is one of the most serious eye diseases in the world for the Boston terriers. Once this trouble turns up the dog feels intense pain in their eye. The final stage of this particular disease is blindness. Cataracts are a common disease among the old dogs. 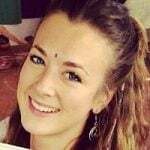 Blurred eye vision also happens to them with growing age. The most common type of eye disease of puppies is called the corneal ulcers. After spotting the problem the owner must consult with the doctors. You may also like our food guide for Shih Tzu. Q: What should I know about Boston Terriers puppies? A: Boston terriers are known as the most handsome and playful dogs in the world. This type of dog is athletic in nature. Although this dog is miniature in size they keep their master busy all day long with their busy activity. They are highly adorable in nature. For more than a century, the people have been enjoying their company. They are extremely loyal to their masters. The puppies can be controlled well with the slightest of training by their owners. They take part in different games and to do that they take the daily lessons from their course coordinators. When the owner takes the bite out of their food they just throw a cute glance at them with wide puppy eyes. And that is powerful enough for us humans to share our dishes with them. Q: How often should I feed my Boston terrier? A: Boston Terriers love to eat food. There is a schedule of their food intake which should be maintained strictly. They are also considered to be a very sensitive species in terms of food consumption. The owner of a Boston terrier should not tweak the routine of their meals at all. It makes them agitated and bothered about the food. For the aged dog, they must be fed twice a day to keep their health intact. It also helps to run their metabolism system well. For instance, it can be said that the fully aged Boston terriers can be given their breakfast at 7 am and dinner at 6 pm. 3 months or less age of dog requires around five meals a day. 6 months’ age of dog requires having 3 meals a day. And the fully matured dog that has an age of 1 year requires at least 2 meals a day. The water bowl should be cleaned every single day. The baby dog should not be separated from their mother before a time period of 2 months has passed since its birth. From 3 to 4 weeks of age, they must take solid food. Q: How much should I feed my Boston terrier? A: A different aged dog requires a different quantity of food. Hence, the volume of food consumption depends on the age of the dog. When the dog reaches 2 months, they require many kinds of nutritious foods. However, if the owner changes the food menu over and over, it will deteriorate the dog’s health. For aged Boston terriers, they must be fed 1 to 2 cup of dry food keep their body stout. The owner must keep their sharp eye about the quantity of the food. They must not allow overeating to their dogs since that can drive them to obesity.